Definition at line 45 of file llvoclouds.h. Definition at line 54 of file llvoclouds.cpp. References LLViewerImage::BOOST_CLOUDS, FALSE, gCloudTextureID, LLViewerImageList::getImage(), gImageList, LLViewerObject::mbCanSelect, mCloudGroupp, NULL, LLViewerImage::setBoostLevel(), LLViewerObject::setNumTEs(), and LLViewerObject::setTEImage(). Definition at line 66 of file llvoclouds.cpp. Definition at line 102 of file llvoclouds.cpp. 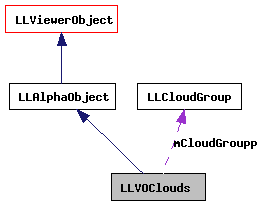 References LLPipeline::allocDrawable(), FALSE, LLViewerObject::mDrawable, and LLPipeline::RENDER_TYPE_CLOUDS. Definition at line 180 of file llvoclouds.cpp. References CLOUD_PUFF_HEIGHT, CLOUD_PUFF_WIDTH, f, gCamera, LLCloudPuff::getAlpha(), LLCoordFrame::getAtAxis(), LLDrawable::getFace(), LLFace::getGeomIndex(), LLCloudGroup::getNumPuffs(), LLCloudGroup::getPuff(), LLFace::hasGeometry(), isParticle(), LLFace::mCenterLocal, mCloudGroupp, LLViewerObject::mDrawable, LLVector3::normVec(), right, S32, LLFace::setFaceColor(), and LLVector2::setVec(). Definition at line 276 of file llvoclouds.cpp. Definition at line 175 of file llvoclouds.cpp. Definition at line 77 of file llvoclouds.cpp. References gPipeline, LLPipeline::hasRenderType(), LLPipeline::markRebuild(), LLViewerObject::mDrawable, LLDrawable::REBUILD_VOLUME, LLPipeline::RENDER_TYPE_CLOUDS, and TRUE. Definition at line 71 of file llvoclouds.cpp. Definition at line 170 of file llvoclouds.cpp. Referenced by getGeometry(), and updateGeometry(). Definition at line 76 of file llvoclouds.h. Definition at line 91 of file llvoclouds.cpp. Definition at line 282 of file llvoclouds.cpp. Definition at line 71 of file llvoclouds.h. 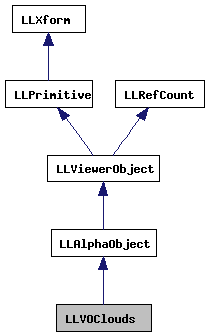 Definition at line 111 of file llvoclouds.cpp. References LLFastTimer::FTM_UPDATE_CLOUDS, gAgent, gCamera, LLCoordFrame::getAtAxis(), LLDrawable::getFace(), LLDrawable::getNumFaces(), LLCloudGroup::getNumPuffs(), LLCoordFrame::getOrigin(), LLAgent::getPosAgentFromGlobal(), LLViewerObject::getPositionAgent(), LLCloudPuff::getPositionGlobal(), LLCloudGroup::getPuff(), LLViewerObject::getTEImage(), gPipeline, LLPipeline::hasRenderType(), isParticle(), llendl, llwarns, LLFace::mCenterLocal, mCloudGroupp, LLAlphaObject::mDepth, LLDrawable::movePartition(), NULL, LLPipeline::RENDER_TYPE_CLOUDS, S32, LLDrawable::setNumFacesFast(), LLFace::setSize(), LLFace::setTEOffset(), LLFace::setTexture(), and TRUE. Definition at line 97 of file llvoclouds.cpp. References LLViewerImage::addTextureStats(), LLViewerObject::getTEImage(), and LLViewerObject::mPixelArea. Definition at line 80 of file llvoclouds.h. Referenced by getGeometry(), LLVOClouds(), setCloudGroup(), and updateGeometry().